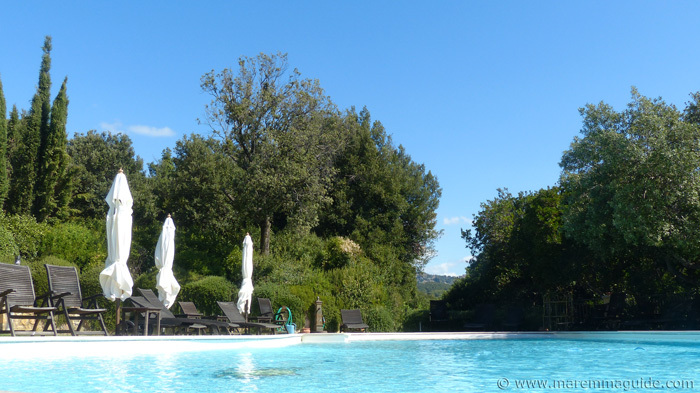 There is one way to have a villa holiday in Tuscany, and there is the new way. The way that will leave you wanting for nothing and have you feeling like a king every day, without lifting a finger. 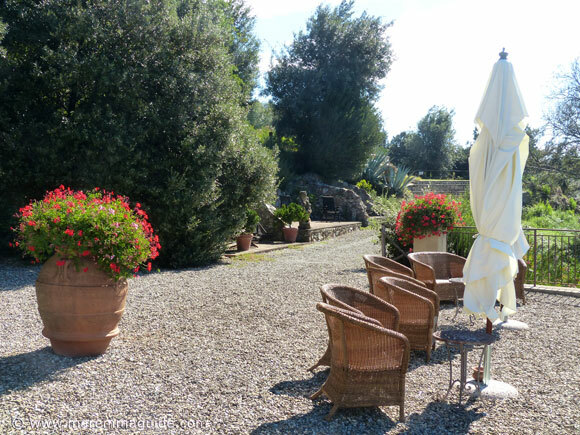 This Maremma holiday villa in Tuscany will have you returning year after year, handing in your car keys as you arrive because you won't want to leave. Quintessential Tuscany holidays don't come better than this. Be prepared for some serious tranquility, rest and relaxation, surrounded by stunning natural beauty. Food first: it is Italy and food is important. With a usual Tuscany villa rental if you want to eat dinner like a king, the choices are to go and do the shopping and prepare it all yourself and then face the dishes in the morning. 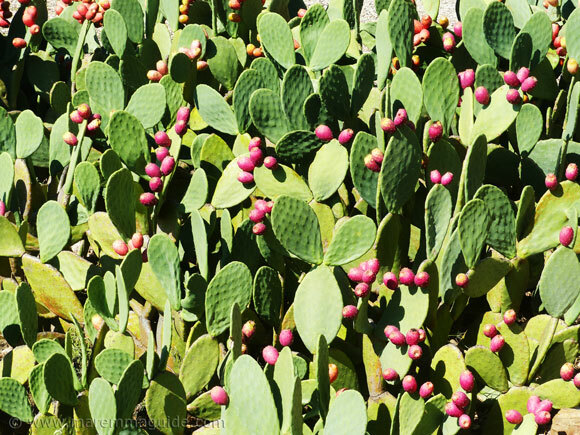 And you are in Italy, so you'll want to eat real home cooked regional Tuscan food, right? Which also assumes that at least one of you in the kitchen is already talented in that respect. Or, drive to a local town and eat out at a restaurant. But then the driver doesn't get to sample quite as much wine as the rest of your party. And that's not that fair. Or, hire a chef to come in. But that takes organising and one of you will have to be around to let them in when they arrive to start preparing the food. Every day. But here at Il Sassone villa you don't have to do any of that. Sip an aperitivo on the terrace, stroll to the dining room or, on a warm summer's evening stay put in the courtyard! Around 8pm, the owners, Simona and Adriano, will bring you your dishes of freshly cooked local produce lovingly prepared by their resident chef. Exquisite food and not a finger to lift for lunch or dinner, day after day after day. Staying locally but not here and want to come to dinner? You can! 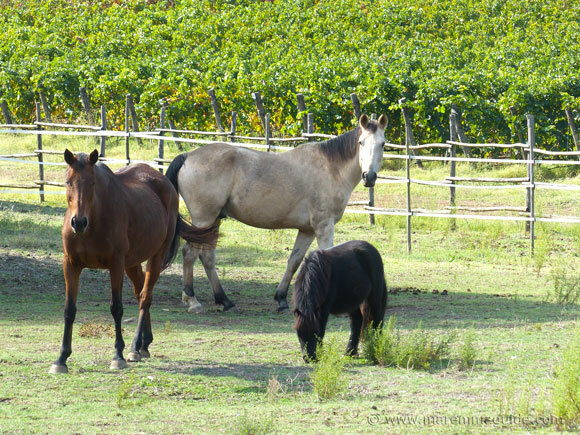 In fact, they have guests who do so every year whilst on holiday in Maremma. The ancient well in the villa terrace with a view. 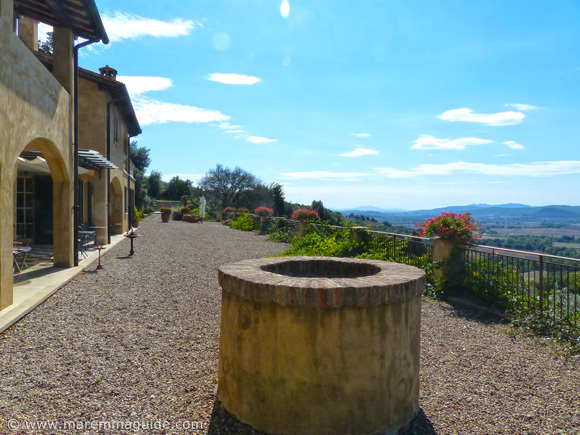 Fancy a barbecue on a warm summers evening in Tuscany but don't want to do it yourself? No problem. Once a week Adriano and Simona cook-up a spectacular spread at the winery for you. At breakfast, if you want to eat fresh that day Tuscan pastries with your morning cappuccino or espresso, the old Tuscany villa holiday way would require you to drive into town to the local bakery whilst everyone else was asleep to fetch them. Or wait until everyone was up and dressed and take them to the local bar. Here you just open your bedroom doors, breathe in the view and walk down the steps to the terrace for breakfast. With biscuits baked that morning and delicious "crostata" Tuscan jam tart. Breakfast is included when you stay, but you can opt for half board or full board too. And just as important as food is wine. 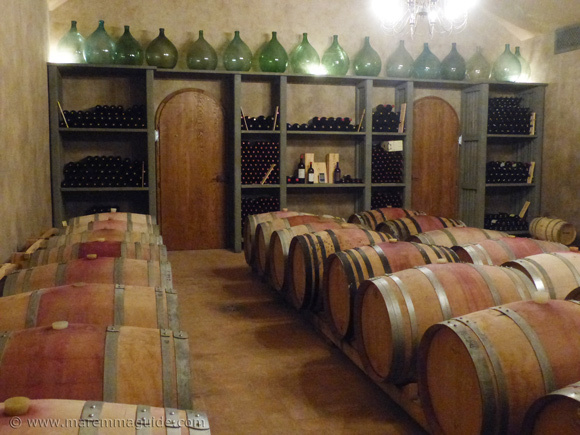 The old way to taste Tuscany wine where it is made is to book an appointment and drive to a local winery. The new way is to just stroll down the hill through the olive grove and between the vines - in all likelihood passing some deer on your way - to the winery and sit in its splendid living room or outdoor terraces and sip away. Always dreamt of picking those grapes? If you are staying during the vendemmia, you won't be the first guest that has asked to help and has stood alongside Adriano and Simona and their staff picking glorious sun-filled bunches. Some guests even return each year to do just that. Third then: and it is food again! 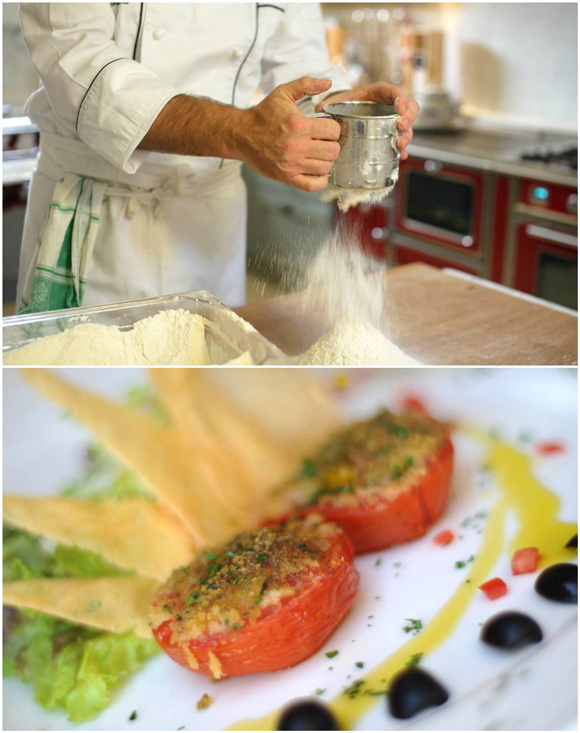 Fulfill a dream and take a cooking class in Tuscany with an Italian chef. Learn how to make fresh pasta and prepare authentic Italian cuisine that will blow the socks off your family and friends and have you feeling as proud as punch that you can do it too. No need to book a week's tuition and travel to a cooking school each day. Do it right here with the villa's resident chef. When you want to. 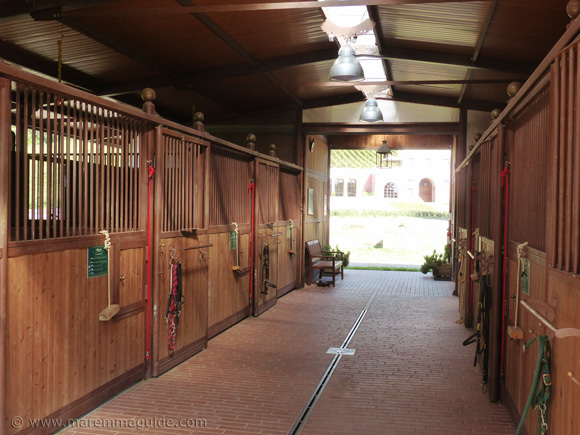 If your dream isn't cooking but horseback riding in Tuscany, amongst vines and Mediterranean macchia, but you think it will be too complicated to organise whilst you are here, it isn't. 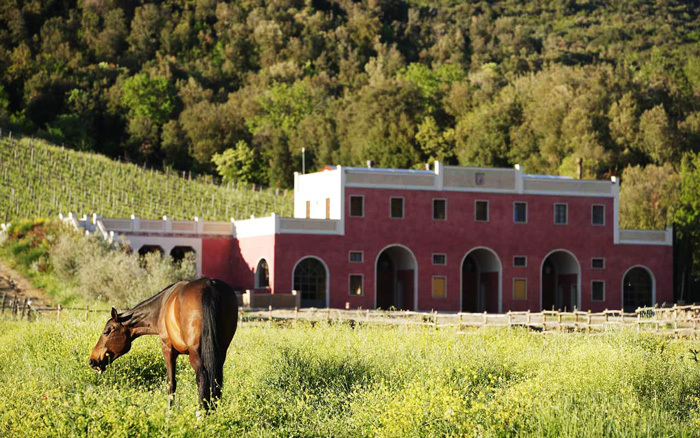 The estate stables are located below the winery, and the trails take you through the property and beyond into stunning Maremma countryside. Inexperienced, but still have that dream and would still love to try whilst you are there? No problem. The estate trainers and guides are available for individual lessons for all levels. And when you have finished, just stroll back up the hill through the vines to your villa. 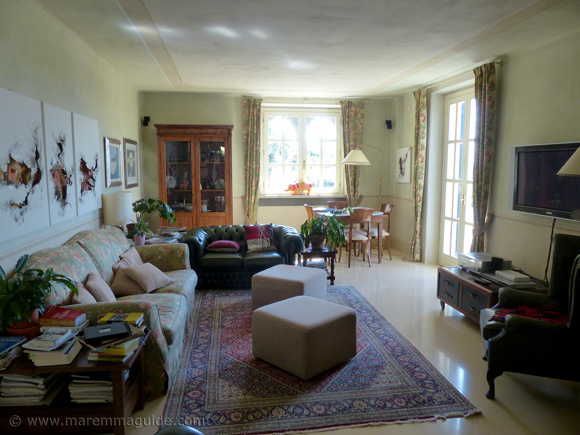 But what makes this stunning Maremma villa so different is that it is Simona and Adriano's home. A home they have decided to open to guests. Guests that they treat as friends: from the moment that you first arrive you are welcomed as an old friend and you will certainly leave as one. The billiard room and library terrace. If you ask people to describe a holiday destination where they would, happily, want to hand in their car keys, stay put and not travel further, most would probably respond describing an all inclusive "resort". With activities, golf courses, pools, and on-site restaurants and shops etc. But at this special Maremma villa, you will want to do just that. To offer-up your car keys to Adriano - he doesn't ask for them, by the way! - for an altogether different reason. Because, here you are left wanting for nothing to fulfill that lifetime quintessential Tuscany villa in the sun dream. 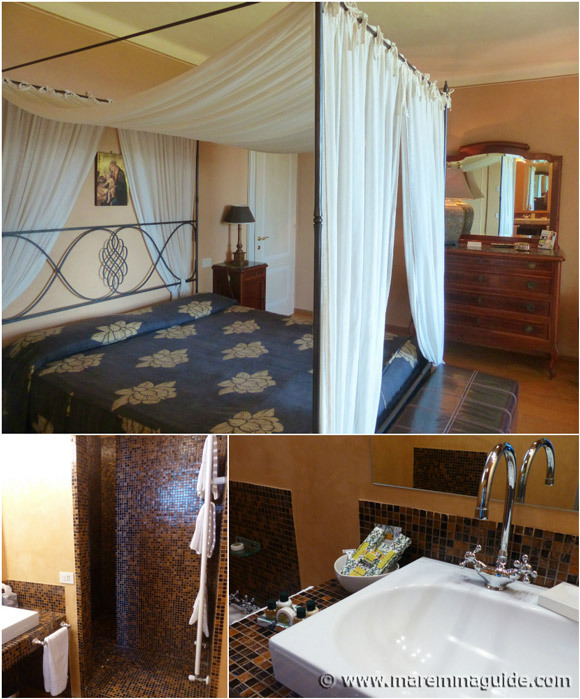 The villa accommodation at Il Sassone is perfect for couples seeking some serious rest and relaxation. As well as a family or group of friends holidaying together. Book all six rooms and the whole villa and its estate becomes yours with the staff and Adriano and Simona on hand for when you need them. It is testament to just how special Simona and Adriano make their guests feel that the hardbacked books you will find on the coffee tables in the living room full of photographs of Il Sassone aren't theirs. Well, they are. What I mean is that I took them to be produced by them for their guests to read etc. But it turns out, and is so evident when you open their full colour pages, that their guests have compiled them and sent them to Adriano and Simona. Storyboards of their wonderful time spent on holiday at the villa. 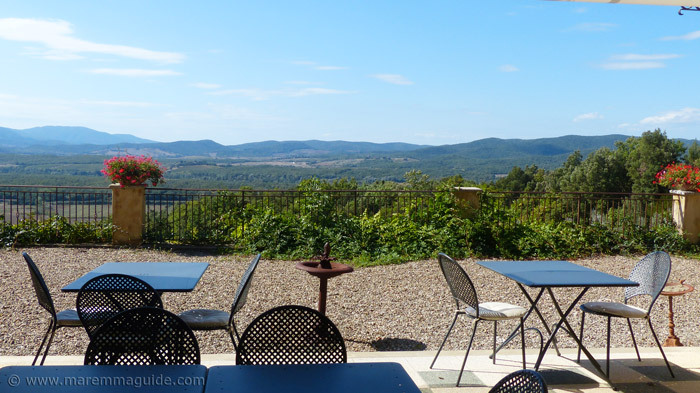 The terrace view of Maremma's rolling hills. 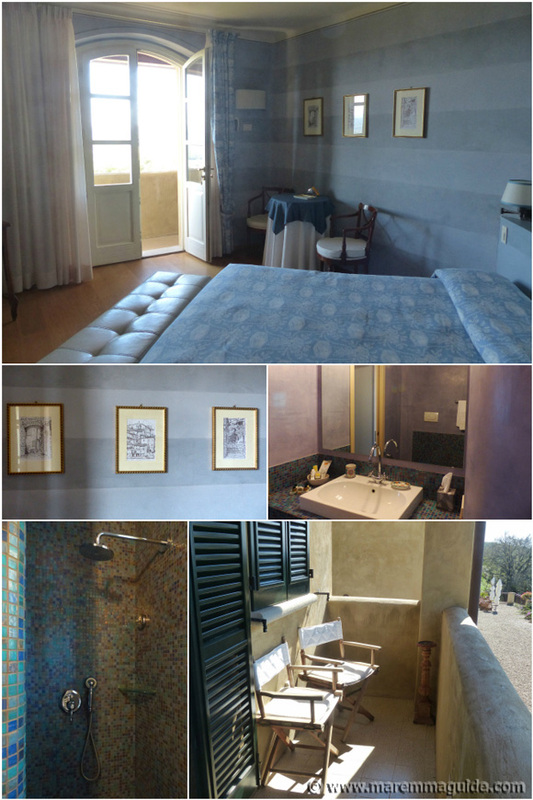 One even spans three years, starting with the very first time the family stayed at Il Sassone and the places they visited. A gift made by friends for friends. The front door on a sunny September morning. Another is a beautiful wedding album - with tissue paper sleeves - sent by a young couple who were married in nearby Massa Marittima (a wonderful place to get wed in Tuscany) and held their wedding reception on the villa terrace. They too have returned. "Adriano & Simona, I feel like a king when I am at Il Sassone." The outdoor breakfast and dining courtyard. The view extends much further: it is just that my camera couldn't capture it all! 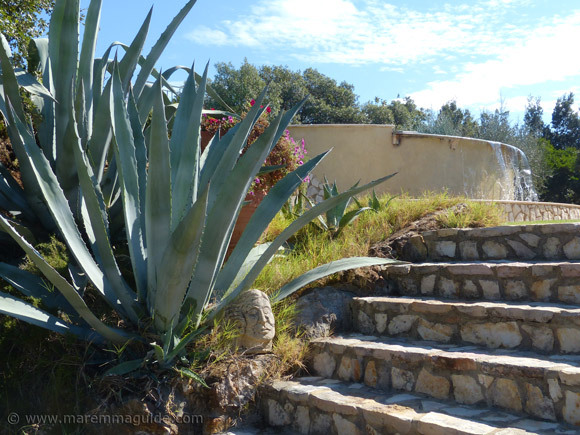 All the way to the sea and Monte Argentario along Maremma's Costa d'Argento (silver coast). There is no light or noise pollution here; the night skies are jet black and the still of the night is profound. In August, when the meteor showers cross Maremma's skies, Simona and Adriano turn-off the terrace lights so you can watch the whole spectacle, shooting start after shooting star, sat here. What more could you ask for? Just look at them; in the summer those tendrils are covered in blooms. 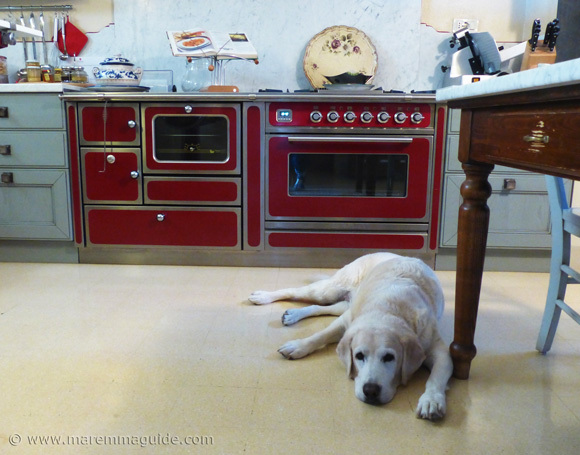 This is the villa kitchen and one of the very friendly four-legged members of Simona and Adriano's family. 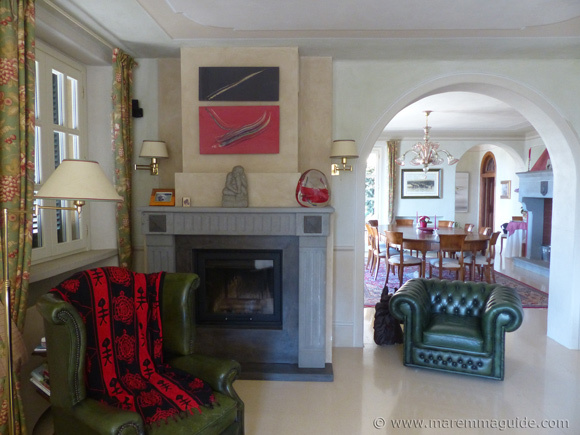 It is a warm - with its own old wood-burning stove - lovely informal affair, where you feel instantly at home. The chef has his own kitchen that adjoins this one. Where you will find two more log fires. There are just six en suite double or twin bedrooms. Each one decorated in a different colour and decor: a lovely mix of modern comfort and antique furniture, a lot of which has been in Simona and Adriano's families for generations. The overall sense is of a homely, lived in and loved feel, with a touch of luxury. The kind of decoration you would do yourself if they were your guest bedrooms. One of the bedheads was Simona's grandfather's and you can still see his initials carved in the panels. The bed is new! Each bedroom has a small television and the bathrooms have mosaic tiled large walk-in showers. In the mornings the light comes flooding in through the French doors and the view across Maremma is all yours. This room even has its own fireplace. 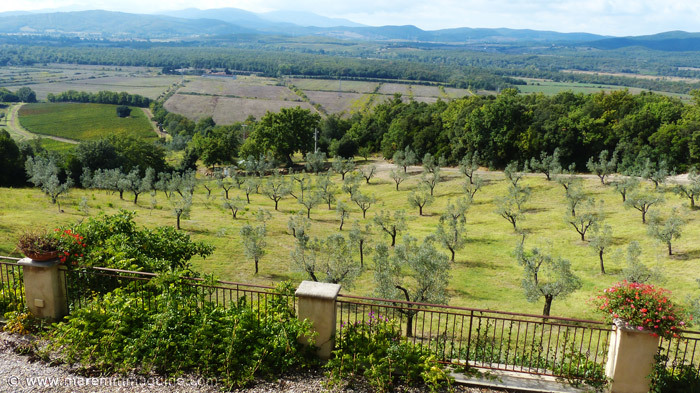 Your morning view from your French window doors and balcony over the Perola valley in Maremma. I could put up with that forever! 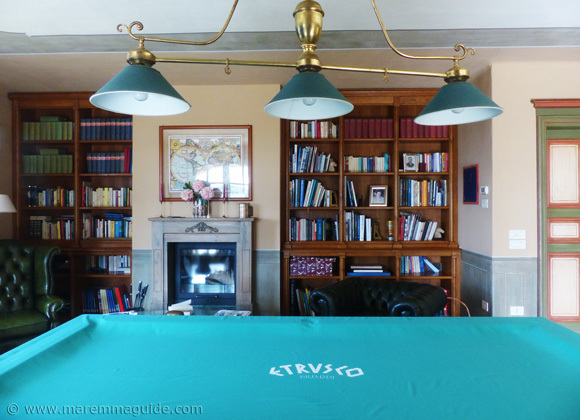 And, even if playing a game of billiards of an evening with an after dinner drink wasn't actually on your list of "must haves" when you were planning your Tuscany holiday, I am pretty sure that it is now! There's even a real log fire to keep you warm whilst you are snuggled in one of those leather arm chairs on a chilly autumn evening. It is hard not to feel that the whole place, and the panoramic view set out below it, is yours, all yours. 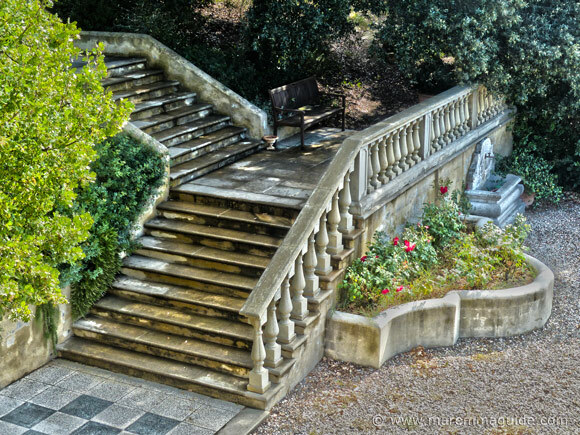 The wonderful stone staircase down into the garden looks so romantic, even after an early morning October shower. No wonder a bride or two has chosen to have her wedding photographs taken here. The whole scene is incredibly beautiful and looks simply stunning in May and June when the summer roses are in full bloom. 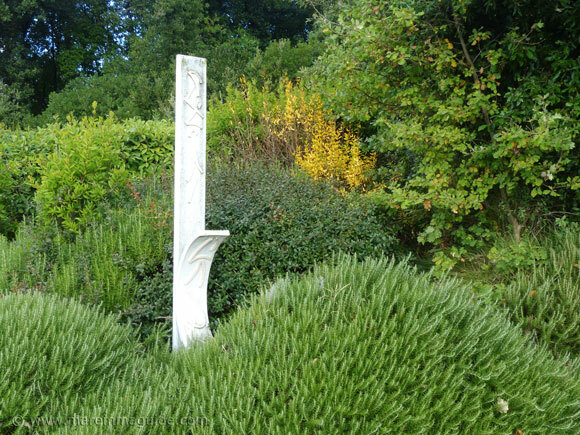 But the gardens don't stop here and nor does Simona and Adriano's decoration of the villa with art. 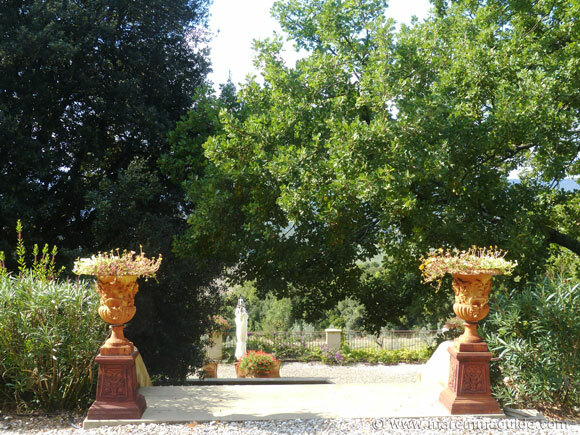 When you go walking through the olive grove and vineyard into the estates woodland and Mediterranean macchia, on a curve in the path or road here and there, you will spot sculptures like these. Even the winery walls are covered in colourful abstract paintings. 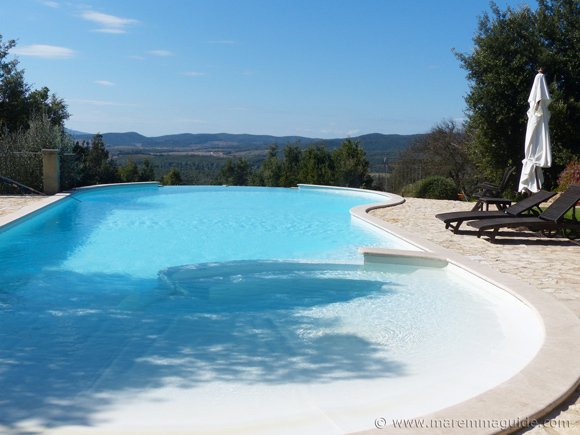 Now, no villa in Tuscany dream is complete without a swimming pool. And ll Sassone has a wonderful infinity one with a view made in heaven. The path to the pool. At one end of the pool you have nothing less than a stupendous 180º view of Tuscany countryside, of wooded hills, olive groves and vines. 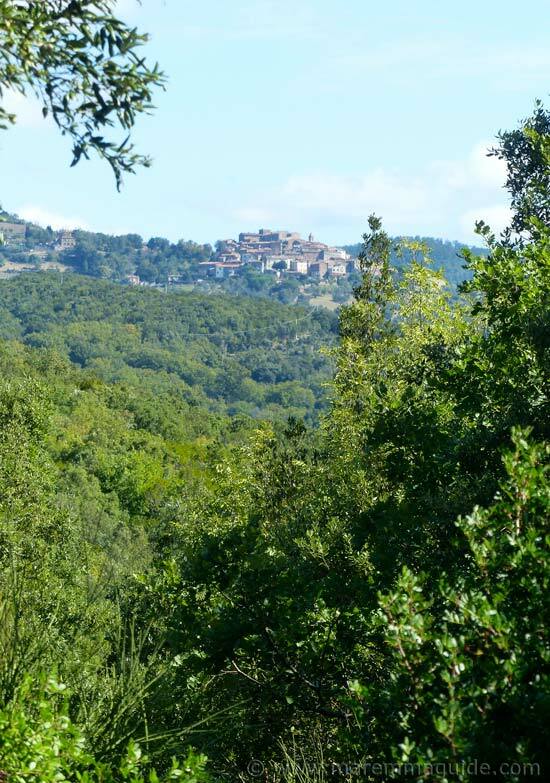 At the other, a massage and whirlpool with a view to the medieval hill top village of Tatti with its mystery of 100 doors (a must visit in Maremma). The pool is completely chlorine free: the water purification and cleaning system uses sea salt. You can trek on foot or ride horseback there: the path from the villa pool takes you all the way to its historic centre. The pool comes with its own immaculate lawn, view over the Perola valley, and a solar-powered outdoor shower. Pool towels abound and, if you are planning a trip to one of the local beaches or natural thermal spring baths - you should! - just let Simona or one of the staff know, and they'll make sure you have fresh towels to take with you too. that we provide the towels for the swimming pool and also, on request, for going to the sea or to the thermal baths surrounding the region (so that the guests can avoid to bring something heavy in the luggage and have clean towels for the pool every day). 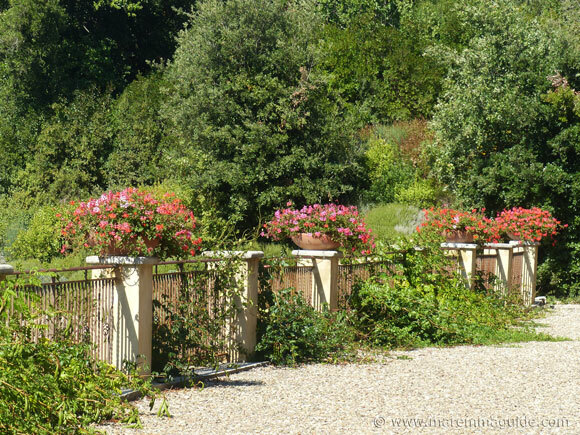 Those lovely round bushes with blue flowers are rosemary: just brush them as you pass and they will release a wonderful fragrance of Tuscany in summer. 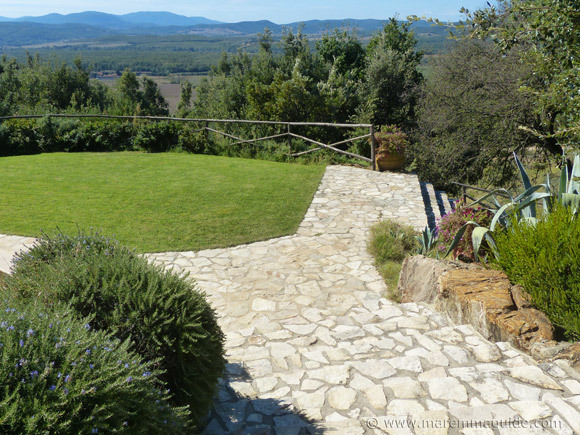 The immaculate lawn with its own view over the Perola valley. 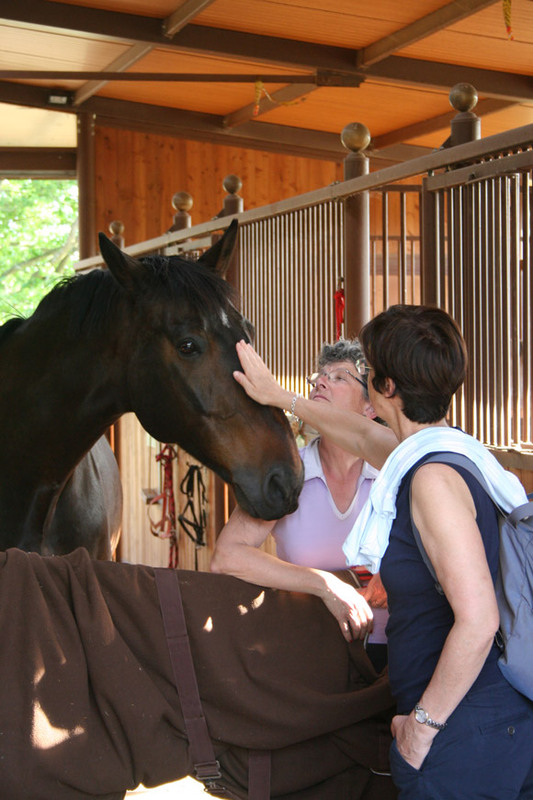 Don't want to go riding, but love the idea of being able to stroke and talk to the horses each day? then do :) They are part of the family at Il Sassone and will be very happy to see you. As will Stella, the family cat, whose favourite spot is here; she will come and greet you in the hope of a stroke too. Meet Simona's beautiful and oh so gentle horse, "Pascolo". Pascolo, Simona and a friend having a "chat" together. You can bring your own horse with you for a holiday too if you want to. 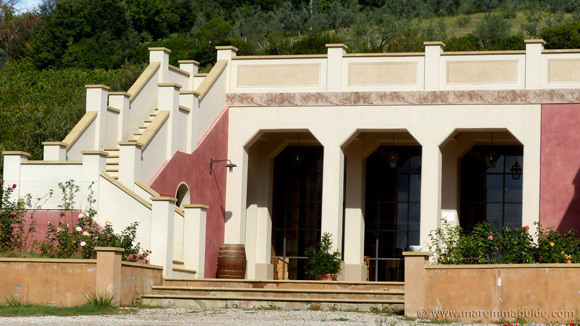 The villa is the building tucked-away on the hill above the rose coloured winery. 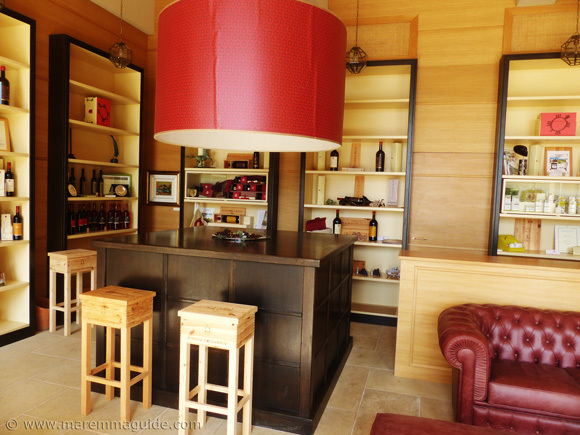 Between it and the "cantina" - designed by Adriano - are the estate's five hectares of vines. Take the walk from one to the other and you'll be greeted by shimmering darting dragonflies. They tend to like to come into the winery too! The winery is at one and the same time both a beautiful and functional building, with an ever present sense of open space and a play with light. 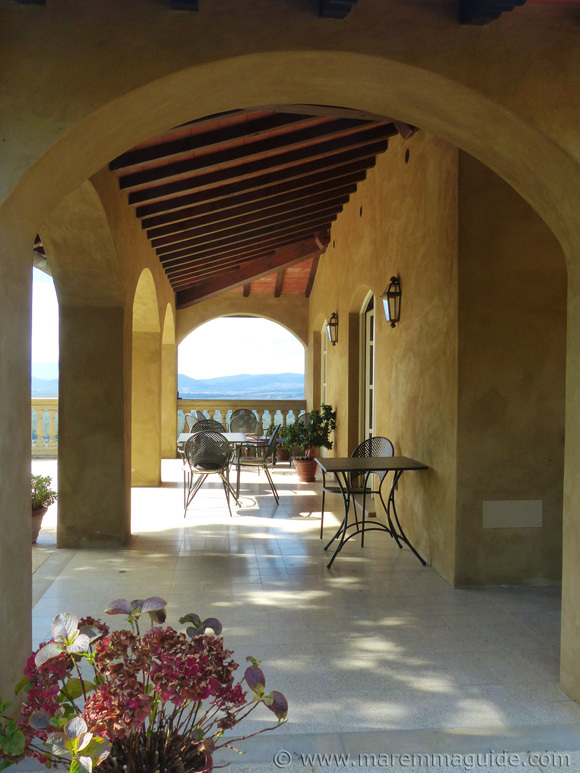 The staircase on the left takes you up to the wine tasting room and its large balcony terrace. 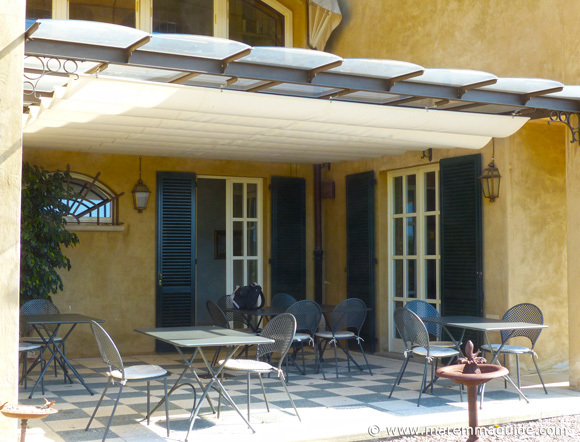 Where you will find the barbecue, tables and chairs, and huge straw "sofas" to relax on, surrounded by vines, citronella, lavender, red roses and rosemary. 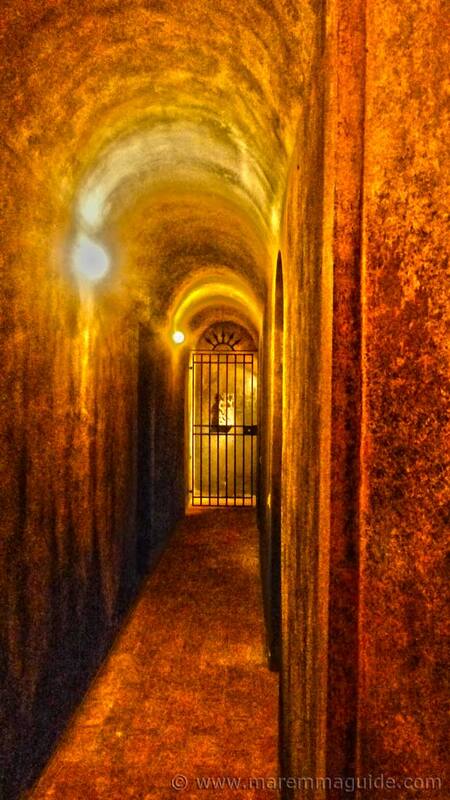 The heart of the Maremma winery. 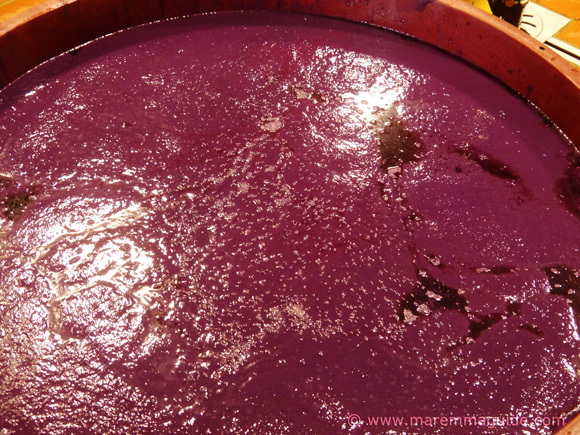 Who could resist putting their hands into a vat that is this colour? I didn't and it was fantastic! 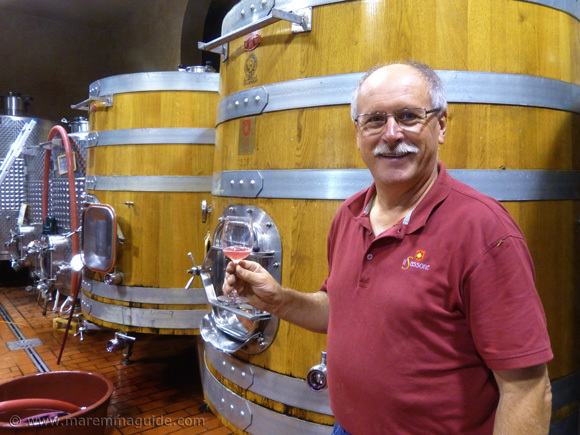 Adriano and their "Corollo" Rosato wine in the making. When you walk through one of those wooden doors in the photograph above, you enter this dark corridor with its own piece of art at its focal point. 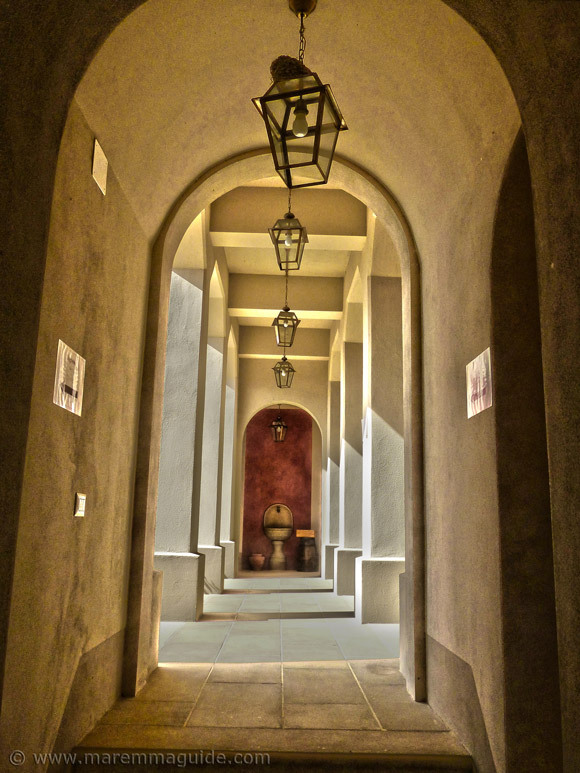 On your tour, Adriano will turn you left, still walking in the dark, until you are presented with this magnificent structural view: an external corridor lit by sunlight and decorated by shadows. That takes you to the wine tasting room and its courtyard. The room has the ambience is of a gentleman's living room, with deep Cabernet-Sauvignon coloured leather sofas and a stone floor. It perfectly reflects Adriano's style. 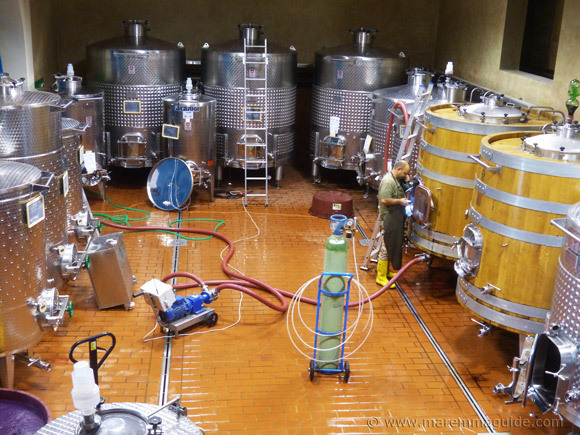 It is a room with a job to do: it is where they introduce and sell their wines to new customers. But it is a room in which to linger and talk too. To relax and enjoy the moment in great company. Adriano is a busy man - when I first met him he was in the swing of the vendemmia - but his warm welcome and our time together which ran into hours, gave me no sense that he needed to be anywhere in a hurry. He wanted to show me what it is he and Simona have created, their home, their land. And he did so as if I had been a friend visiting them for the first time. Adriano and Simona love what they do. Il Sassone is their home, their work, and their passion. And it shows. 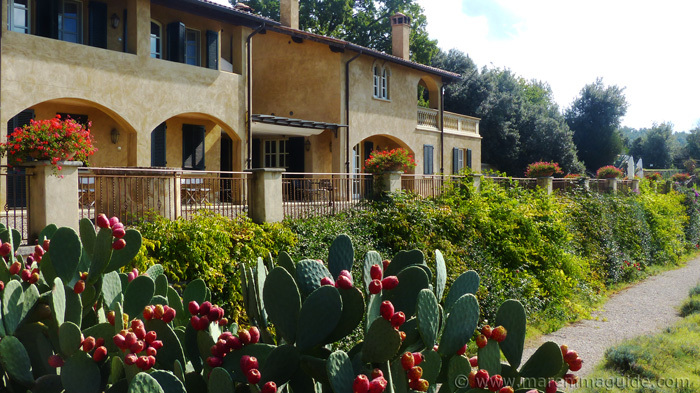 You don't have to book a whole course or commit your vacation week to take a Tuscany cooking course in Maremma. 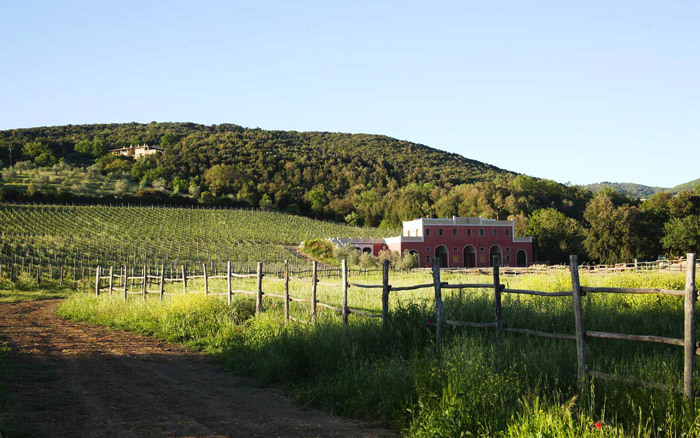 Here at Il Sassone, things are much, much, more relaxed - just like Maremma - and you can choose to take just one, a few, or as many lessons with the estate chef, Bruno, as you like. Select the produce for the day, prepare and cook the dishes alongside him in the villa kitchen - we are talking very small groups of just a few people - take a break, and come back for dinner to eat them with your friends and family. Bruno is from Napoli and his recipes are a blend of Neapolitan and Maremma cooking. Just imagine how many wonderful recipes you could master and how your heart will sing when you get to reproduce them with confidence back home. Visiting in the winter and at a loss as to what to do on a grey day? Simona and Adriano's nephew is a Milano chef and cake designer, super skilled at sugar craft and cake decoration. Let them know you are interested and you'll find yourself in the kitchen for an afternoon surrounded by icing, learning some new skills you never thought you would in Tuscany! And the journey up to the villa is a special one. Once you leave the main road for Il Sassone you soon change from a tarmac road to an unpaved one and, slowly, climb a hill. Pass a house on the left and then up and up. At which point you will need to change down a gear and then some! Catch a view of the villa and the excitement begins. 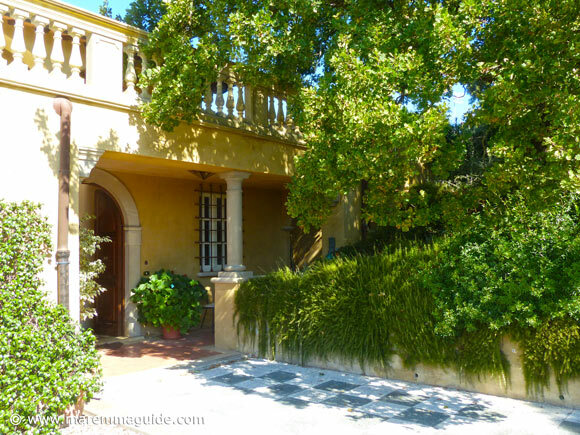 Reach the top of the hill and two huge wrought-iron gates greet you. Closed. You will need to press the intercom button (on the right) to get them to open. Then you drive down, down, through woodland. Past sculptures. Across a stream. And once over, up and up again through Mediterranean macchia. 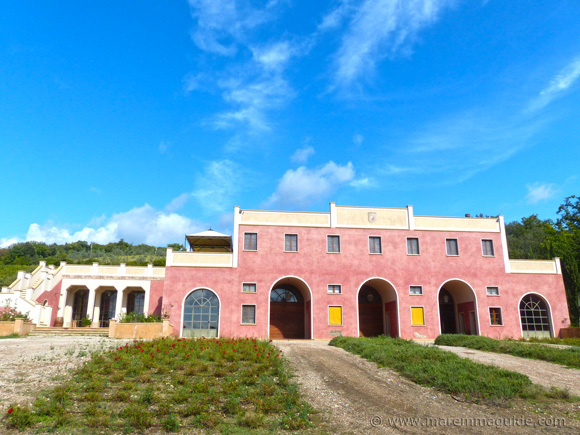 Past a turning on the left for the "cantina", until the view opens and there, right in front of you, built high-up and fronted by an olive grove is the villa. Stunning! But, there are other very special delights if you are lucky. Check on availability and prices.